ARLINGTON, Texas — The wait was excruciatingly long, especially since Lamar Jackson was all dressed up and ready to go. The former Louisville star quarterback had arrived at AT&T Stadium so many hours earlier to revel in every moment of the pre-NFL draft hoopla, and Jackson definitely looked the part of a first-round pick as he strode along the red carpet wearing a green Gucci suit. Once the actual selection process began, however, Jackson repeatedly heard other names called, including those of four other quarterbacks, while he sat with his mother anxiously awaiting his moment on stage, both literally and figuratively. 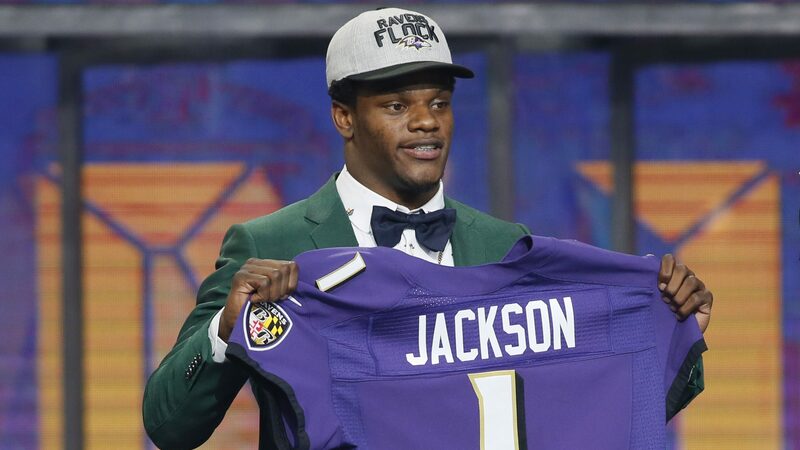 And with the final pick of the night, the door opened: The Baltimore Ravens brought Jackson into the NFL. The Ravens chose someone whose motivation only increased as 31 other teams sought help elsewhere. Longtime Ravens general manager Ozzie Newsome, who plans to retire after the 2018 season, traded up to take Jackson 32nd overall, capping a first round in which the most intriguing prospect of the five signal-callers selected got what he wanted most: a chance to prove the doubters wrong. Now, the Ravens must also do their part. Ravens management hopes Jackson proves to be a worthy successor to Joe Flacco, who, at 33 and entering his 11th season, is on the back end of his career. If the transition from Flacco to Jackson begins in earnest, Baltimore head coach John Harbaugh should make major changes on offense to support everything that the superbly athletic Jackson does best. Harbaugh could probably get some good advice on the subject from Mike Shanahan. In 2012, the former Washington Redskins head coach and his son, Kyle, then the team’s offensive playcaller, devised an offense that incorporated many designed QB runs and college option-style plays to capitalize on Robert Griffin III’s skills. Griffin had a spectacular season. He won the NFL’s 2012 Associated Press Offensive Rookie of the Year award and the Redskins won the NFC East division title. Based on Shanahan’s evaluation of Jackson’s college game footage, Baltimore’s coaching staff should be very excited. Lamar Jackson of Louisville is selected as the No. 32 overall pick to the Baltimore Ravens in the first round of the 2018 NFL draft at AT&T Stadium in Arlington, Texas. In a potentially cruel twist of fate for Griffin, the blueprint that helped him achieve success as a rookie could contribute to ending his comeback bid with the Ravens. If Jackson fares well in the preseason, it’s unlikely the Ravens would keep both Heisman Trophy winners (Griffin got the award in 2011, Jackson in 2016). After Griffin was out of football for the entire 2017 season, Baltimore signed him to a one-year deal earlier this month. Jackson’s potential is off the charts, Mike Shanahan said. Not everyone around the game shares Shanahan’s view. From the moment that former NFL GM and current ESPN analyst Bill Polian ignited a social media firestorm by suggesting that Jackson should switch to wide receiver, Jackson has been in a spotlight he would have rather avoided. In addition to dealing with the stigma that many African-American QBs face by being labeled as dual-threat passers (it’s code for they’re better runners than passers), Jackson found himself having to push back against talk that he’s no longer good enough to play a position at which he was spectacularly productive in college. It’s not the least bit surprising that he’s not happy about it. Preferring to keep the focus on his passing, Jackson declined to run the 40-yard dash at the NFL scouting combine or during Louisville’s pro day. He made his position clear. Shanahan believes the Ravens won’t be disappointed. It took a while, but Jackson can finally get started.